At an event where the very latest bleeding-edge cameras were present – like the medium-format, image-stabilized Fujifilm GFX100 and the seamlessly stitching Ricoh Theta Z1 360 cam – one product stuck out like a sore thumb at The Photography Show: the Solarcan. “Some of the pro photographers are really struggling to understand that we’ve brought it back to basics,” says Sam Cornwell, who along with wife Beverley is the driving force behind this extreme-time exposure camera. The Solarcan takes extreme-time exposures of the sun – we’re talking days, weeks, months or even years. You simply remove the black tab to let the sun’s rays pass through the pinhole and onto the photographic paper inside, then when you’re ready to ‘develop’ you just remove the paper, take a photo of it or scan it, and then invert the image. 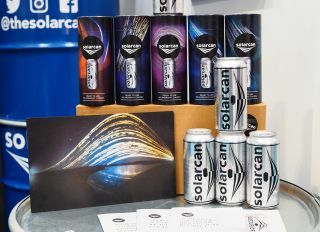 Solarcan was among a number of other products at the show – such as the Thingyfy Pinhole Pro 18-36mm lens, the Lomography Lomogon 2.5/32 Art lens, or the Pixl-latr 35mm and medium-format digitizer – that embraced and celebrated low-fi analogue photography. “It’s really important to stress what Solarcan is: it’s people’s entrance into the analogue film community. So there’s a resurgence with the film photography market, which sort of died 20 years ago or so, but it’s slowly coming back. “And people are coming around now – millennials or people that sort of age are starting to rediscover or, for the first time, find film photography. A lot of our community, it’s the first time they’ve used film. And then they go on to make their own, or start experimenting with 35mm film and analogue cameras." It’s not just educational in terms of photography; it's also a fascinating way to introduce younger generations to astronomy. “My background personally is art, astronomy and photography,” Cornwell says with a smile. And I like the way Solarcan puts all those things together into one thing, because astronomy is the movement of the sun. For more information on Solarcan, including workshops for schools and clubs, visit www.solarcan.co.uk.